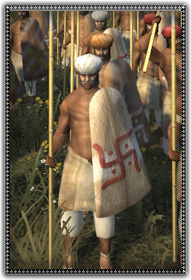 The conquering masters of Indian lands, usually Islamic, commonly levy the lower classes into their armies. Regardless if the rulers are Rajput or not, this is more of a collection of men than an army. Despite their complete lack of armor these men have a sturdy shield and an iron tipped spear to put up some sort of defense against cavalry. Only a foolish master would put these men in a standing army.